Israel is the main reason why the peace process in the Middle East failed, insists Lebanon’s Prime Minister, Sheikh Saad Al-Hariri. 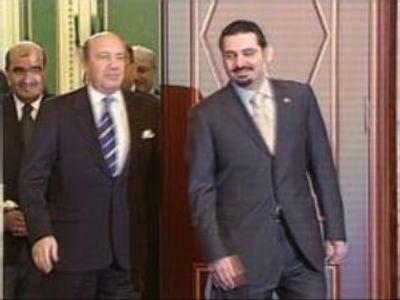 RT: Do you think that a resolution of the political crisis in Iraq will have a positive impact on Lebanon and lead to a resolution of the political crisis there as well? Saad Hariri: I think that the main problem here is that the key issue is ignored – I mean about fair peace for everybody. In 1991, there was a peace conference in Madrid; then there was also the Arab Summit Conference in Beirut, where the participants came up with the Arab Peace Initiative. But now the peace process is being destroyed by different amendments which will lead us to nowhere. The principles behind the resolutions – which were supported by everyone – demand that Israel should follow the resolutions. There would be no need now to talk about arms and other problems, had this peace process not been buried in the 1990s. We face many difficulties today, because Israel denies Palestinians their legal rights, refuses to return the Golan Heights to Syria; the Shebaa Farms, Kfar Shouba and Ghajar – to Lebanon. But the Arab Peace Initiative was adopted. Why is Israel doing that? The international community has an obligation here. It needs to know that we can only solve problems in the region through a fair peace for all. RT: Do you think Israel is responsible for the deadlock in the peace process? SH: Not only is it responsible, Israel is the main reason why the process failed. Netanyahu’s government is not able, nor is it willing, to continue with the peace process. RT: What role could Russia place in promoting the peace process in the Middle East? SH: Russia participated in the Madrid conference and is part of this process. It is also part of the ‘quartet’, mediating in the Israeli-Palestinian talks. Therefore I think Russia could play a very important role. It has many friends in the Arab world. We need to use our relations with Russia in order to communicate the Arab stance on things to the international community, because it is very unnerving to see the injustice done by Israel to Palestinians, as well as to Lebanon and Syria. We can no longer ignore this. Israel is trying to impose its own agenda and keeps seizing land daily. Unfortunately, the world is not doing anything about it. This is unacceptable in all aspects – international, human and religious. It goes against the Geneva Convention and any other regulations. Israel is breaking all international conventions. RT: Everybody knows that your relationship with Russian leaders is very good. What key issues will you discuss during your visit to Russia? SH: Politically, relations with Russia are very important to us. We would like these relations to be economically beneficial as well. We would also like to find out how Russia could assist Lebanon in equipping our army and security forces. In this respect, we are going to propose some ideas to our Russian friends. We have been promised certain assistance, and Lebanon is ready to work out a plan for purchasing Russian weapons. Lebanon has purchased arms from Russia in the past, and now we are trying to figure out if we could get some discount on weapons for the Lebanese Army and security forces. RT: And what about jets? SH: We will study the issue during our visit. Our pilots are going through training, and hopefully this visit will be a successful end to what our President has started. RT: In what areas can we expect agreements to be signed with Russia? SH: We’re considering signing an agreement on culture, and between our countries’ ministries of justice.We hope that agreements in other areas will be studied properly, especially those concerning armaments for the Lebanese Army. RT: Russia maintains its position regarding the [UN] international tribunal [on the killing of former Prime Minister Hariri] and fully supports it, what is your standpoint on this position? SH: It is a natural position, since Russia is driven by the idea of justice and has never abandoned it; and that is why we are grateful to Russia for this position which we consider to be natural, because Russia supports Lebanon; not only in the matters related to the international tribunal, but also in everything Lebanon had to go through over the past decades, with all the wars, in 2006 and earlier. Russia has always been on Lebanon’s side. RT: What kind of relationship do you have with the Syrian government now? SH: We've got wonderful relations. We keep up contact. Our ministers keep in touch with their Syrian counterparts. I hope that the gap between us will get smaller. We want to develop a special relationship with Syria. It will be beneficial for us in terms of politics, security, economic and social policy. We are constantly working on maintaining this kind of relationship, which is made up of the political relations between the two countries, economic ties, as well as relations between the governments. RT: You’re visiting Iran at the end of the month, what will your talks be about there? SH: The time of the visit is not defined yet. We hope that it will take place, and that we’ll cover all issues on the agenda in our talks. I was open about talking to Iran’s President [Mahmoud] Ahmadinejad during his visit to Beirut. We cooperate with Iran in a number of areas.In the energy sector, they are giving us large incentives in order to enter our market. We cooperate in politics, too, and our position there is that any country has a right to use nuclear energy for peaceful purposes. We hope that our entire region will be a nuclear-free zone. In terms of peaceful initiatives, we consider ourselves to be part of the League of Arab States, and we shall never support anyone opposing the international community. Lebanon is an independent state, we have our place in the world, and we shall protect it based on these principles. We have certain disagreements with Iran on some issues, but we are in complete agreement with them on a number of others. RT: The Lebanese government is currently in a tough situation caused by the so-called ‘false witnesses’ in the Hariri assassination investigation. How are you going to resolve it? SH: I wouldn’t call it a tough situation. We all agreed that this issue is important, and that the Cabinet must address it. Today, the debate is around the question which body of authority should be appointed to consider the case. Due to certain political reasons, some members are suggesting that it should go to the Council of Justice (Supreme Court) while we believe a regular court is a preferable option. The Cabinet ministers are discussing this issue, and we shall achieve the decision that will satisfy all parties. My opinion is that this issue should be passed on from the Cabinet to a regular court where these false witnesses will be tried. RT: Why aren’t you willing to satisfy the opposition’s requirements to step back from the Special Tribunal in order to keep the peace in the country and avoid turmoil? SH: We have created the government which initially was a national unity government with no such concept as pro-government or opposition forces. We must be united. It would be a political mistake for anyone to consider themselves to be part of the opposition while being part of the government. That’s number one. Number two is that there are indeed concerns about the Special Tribunal, but I think that it would be wrong to talk about this under current circumstances. It all requires a sobriety and dialogue. People need to calm down and act sensibly. Fighting leads us nowhere. At the end of the day, we all have to live together in our country and keep up the dialogue. If, God forbid, we develop different views then the country will have a problem with that; we must get back to the negotiating table. The country requires peace, and that’s the most important thing. Yes, we indeed still have some disagreements, but is it really the way out? There must be peace, otherwise there’s no way to achieve positive results in dialogue. How can an emotional person be in dialogue with other people? I keep saying it all the time that we need to calm down. The Lebanese people need an opportunity to live a peaceful life, because people are tired of all the discord. And we must do everything to achieve it. RT: Some think that if pressure on you on the part of the opposition builds up, you will have to resign. Is that possible? SH: I haven't felt much pressure on me, and I think that pressure is being put on other people, rather than on me. As for resignation, I was elected by the Lebanese people. The majority expressed their trust in me, so that we could form a government. I became Prime Minister thanks to the support of the majority and I am set to continue working together with everybody.